Why are they all in love with Harris? Evening (2007) – A psychological drama about hasty life choices and late remorse told from a feminine point of view. A critic-acclaimed novel which screenplay was written by Pulitzer Prize winner author Michael Cunningham (who wrote The Hours) and whose dream ensemble cast consist of names like Meryl Streep, Vanessa Redgrave, Glenn Close, Natasha Richardson, Toni Collette and Claire Danes, among others. It should have been a great film. But it wasn’t. Ann (played in old age by Redgrave) is a dying woman confined in bed while receiving all the attention her two loving daughters (Richardson and Collette) dedicate to her last moments. She keeps mentioning the name Harris over and over, and her daughters have no idea who the man in question might be. Of course the audience will know who he is long before her daughters. 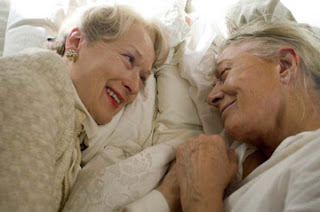 Through constant flashbacks, the director goes back to the 1950s, to the day where Ann (now Claire Danes) met a doctor named Harris (Patrick Wilson) during the tumultuous weekend her best friend Lila (Meryl Streep and real life daughter Mamie Gummer) was supposed to get married. Lila is not quite sure about the marriage. She has been in love with another man – Harris – since she was 15 (she’s now 24), but Ann is falling in love with him as well. And then, there’s Lila’s brother, the alcoholic and attention-seeker Buddy (Hugh Dancy, the best acting in the young cast) who seemed to be affected by Harris as well. We have now a love square. Why is this Harris so magnetic? I haven’t read the book, but I’m afraid the screenplay miserably failed on transporting to the screen how inspiring he is supposed to be and Wilson’s heartless performance didn’t help either. In addition, Claire Danes doesn’t convince the audience even on post-romance flashbacks (a frustrating meeting in an awful rainy day) whereas Redgrave in her most tormenting dreams makes you feel sorry for that woman’s lost love. More old Ann moans on her past, more you want to know about it, and luckily most of the action is set in the 1950s. Unfortunately, the movie answers (or doesn’t answer at all) important questions too slowly through a constant still atmosphere that frustrates deeply in the end. I can’t really believe the news these days… It’s been a while I have followed as less of daily news as possible. But sometimes you can’t help it, the news come to you no matter what. Especially big tragic news. As it’s clear for everyone else at this point, school massacres are no longer a north american issue. It’s been happening all over the world now. No matter which were the cases, I just can’t really understand why. I guess I never will. 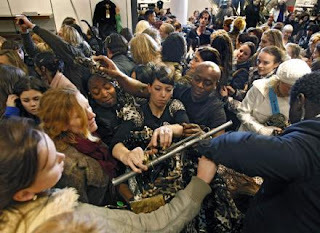 Changing the subject drastically, has anyone gone to H&M this morning? I haven’t. I’m not quite sure if the collection designed by Cavalli has arrived here where i live. I’ve taken a look in some of the clothes on net and there was nothing so appealing. Maybe because the only animal print articles I’d like to possess someday would be leopard printed peep-toe pumps and a leopard printed winter coat. For the rest, no, thanks. I guess I’m alone in these matters. Just look at the photo above taken today in one of the swedish brand stores located in Amsterdam. So funny. Is she happy or is she sad? It’s been a while I don’t go to the movies. I’ve missed Stardust, I haven’t seen Evening and today it’s the last Rendition day in Randers theater after only a week. 9h15pm session, rainy cold autumn night. The film got some pretty bad reviews, though what critics say doesn’t really matter to me. Oh, I’m so lazy tonight. I’ve seen Melinda & Melinda a couple of days ago, and it was one of the best Woody Allen films I’ve seen in a while (Match Point is obviously included here). The story has a very creative and original plot. A couple of writers are sitting on a cafe while discussing about Melinda, a woman who suddenly arrived in a dinner party. Some of the writers will see a drama in her life story whereas some other person will see nothing but elements for a great comedy. The film narrates two different stories about the same character and the only aspect both stories have in common is the fact Melinda is trying to rebuild her emotional life after her divorce. Radha Mitchell, who plays Melinda, is amazing and I can’t believe she didn’t get award nominations by the time the film was released. The comic Melinda is much more colorful, and she makes an equally comic character, played by Will Ferrell (I like this guy more and more! 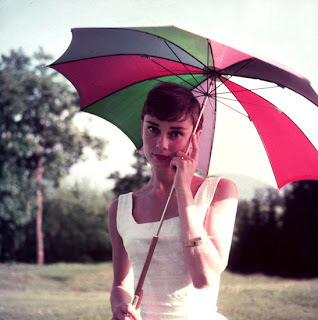 ), to fall in love with her. Many scenes played by Will are hilarious, especially an incident where he’s trying to hear from the apartment’s door what his beloved one and another man are saying in an intimacy moment. Will’s character is so deliciously neurotic that could have been played by Woody himself in his younger years. Tragic Melinda is almost always in a bad hair day. She’s an avid drinker and smoker, besides mixing it up with pills. The best in the films happens when Allen intertwines the tragic and the comedy, as it can’t be always tragedy or always laughing. There’s humour elements in the drama segment as there’s not only laughing in the comic one. And as in many Allen films, Manhattan has never looked so charming and sophisticated, always breathing culture and good taste. 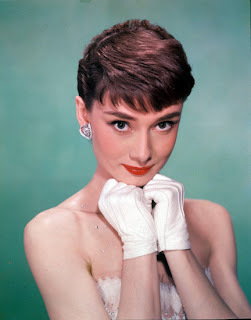 Finishing this fast post, two lovely pictures of sweet Audrey Hepburn, both taken during 1950s. How gorgeous she looks.